Hot off the success of The Hunger Games: Catching Fire, comes another young adult (YA) adaptation that centers around another young female character in the midst of coming to terms with herself and society. Instead of fighting vampires, werewolves, demons, and/or other unseen enemies, this time we are following the journey of a heroine that is similar to that of Katniss Everdeen. Divergent, which was published in 2011 by then first time author and 21 year-old Veronica Roth, uses a lot of the same elements that are found in Suzanne Collins’ The Hunger Games trilogy. They both contain a futuristic post-war/apocalyptic environment, an individualistic female protagonist, an action and romance storyline, and themes that deal with struggles against the authority and the idea of conformity. Fair or not, this classification has many viewing Divergent as the next Hunger Games. Divergent follows Tris (Shailene Woodley) in a world that is divided by factions, which are based on specific personality traits among its members. When Tris learns that she is Divergent and will not fit into any faction, she also discovers a conspiracy led by a faction leader, Jeanine (Kate Winslet), that promises to kill all Divergents. Tris must now learn to fight, protect, and trust other members of her new faction in order to find out what makes Divergents threatening to society. So, is Divergent the next Hunger Games, or is it like the other less than successful YA adaptations? 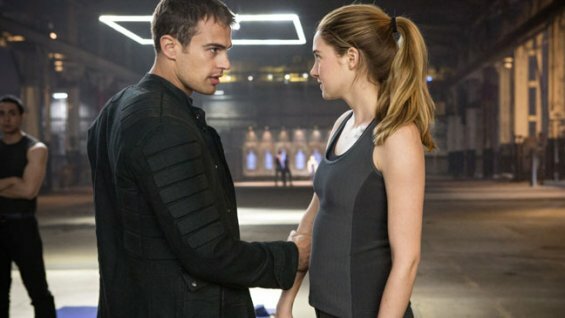 It turns out that Divergent is actually right in the middle of those films. It is far better than those Twilight movies, The Host, Beautiful Creatures, and Mortal Instruments. However, it is not quiet on the same level as the first two Hunger Games movies. It reaches some entertaining cinematic moments, but never fully capitalizes on its material. Neil Burger, who directed the stylish Limitless, brings forth the same visual panache and attention to character development. However, like some of his other films, Divergent is too inconsistent and half-realized. The world is vivid and immersive, yet it is also generic and overdone. The characters are interesting if not all that memorable, and the story spends too much time in material that has been done better before. At the core of the film, there is an interesting social commentary on being satisfied with your place in society. Also there is a compelling message about nature vs. nurture, but these thematic moments are unfortunately a fleeting aspect of the film. If you take away the best moments of the film, which are just about a handful of scenes, the film becomes a formulaic coming-of-age story about a girl and boy who dare to be different. For the most part, Burger does his best at keeping the material and the environment engaging; although, the film is undermined by its knack of falling into genre conventions. Act I and Act II simply follow its genre roles by utilizing aspects from other YA and sci-fi movies. Towards the end of Act II and the beginning of Act III, the pace does pick up and it reestablishes the film’s urgency and significance. However, as fun as the ending may be it is also a somewhat unfulfilling one. This leads to an often mundane experience that leaves you not fully interested in everything you see, but wishing that there was more. Arguably the most consistent part of the film comes from a seasoned cast that keeps the film grounded. The charming Shailene Woodley comes into her own as the lead, and offers a performance that is heartfelt and relatable. She is emotionally present in every scene, and thanks to her welcoming presence she allows us to go along with her on this adventure. We feel every emotion see feels- pain, heartache, fear, and even jubilation. We also believe her when she is confused, distraught, doe-eyed, and when she eventually become defiant. Woodley is what is right with Divergent, and is able to bring life to a character that can represent a great deal to this generation. Woodley also has great chemistry with all of her cast members- most notably with the young Theo James, the likable Ashley Judd, and the worldly Kate Winslet. Unfortunately, our investment in these characters do not last long thanks to the film being overlong and meddling in details that are stale. If The Hunger Games and all of the other YA movies had a love child, Divergent would be the offspring. So, if we look into the genetic makeup of Divergent we would find parts good and bad. Exciting and uneventful. Inspired and unimaginative. Extraordinary and familiar. It is a mixed bag that shows great potential but never fully reaches it. Nonetheless, it still serves as a serviceable introduction to a new YA adaptation that leaves enough of intrigue that can leave one cautiously hopeful for the sequel(s). The cast include: Shailene Woodley (The Descendants), Theo James (Underworld: Awakening), Ashley Judd (Double Jeopardy), Jai Courtney (A Good Day to Die Hard), Zoe Kravits (X-Men: First Class), Miles Teller (The Awkward Moment), and Kate Winslet (Revolutionary Road). It was written by Evan Daugherty and Vanessa Taylor. It was written by Neil Burger (Limitless).